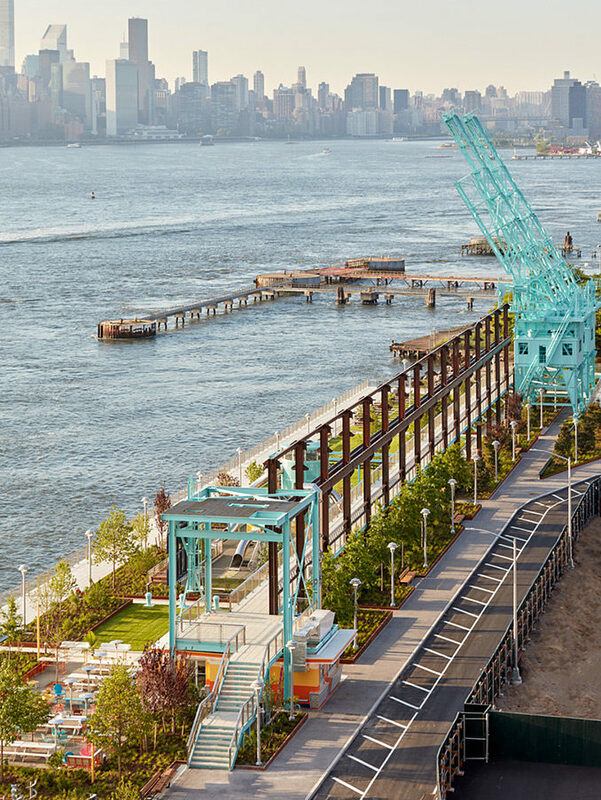 Domino Park, New York’s newest waterfront recreational public space at the 11-acre Domino Sugar Factory site opened on Sunday, June 10. 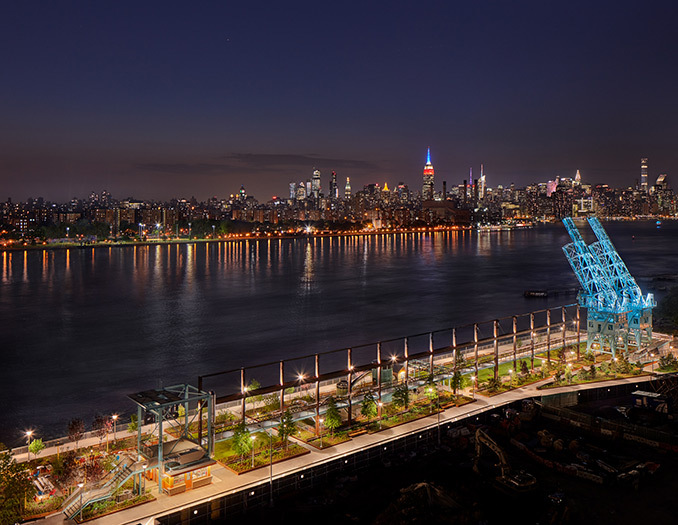 Conceived in partnership between Two Trees Management and landscape architecture firm James Corner Field Operations, the lead designers of the High Line, Domino Park is an unrivaled quarter-mile long public park located just north of the Williamsburg Bridge that celebrates the history of one of New York’s most iconic industrial waterfront sites. 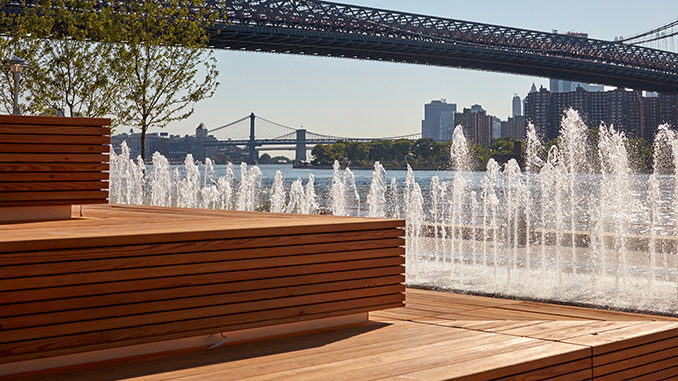 The waterfront park reflects Two Trees’ emphasis on historic preservation, a guiding component of the overall Domino Sugar Factory redevelopment master plan. 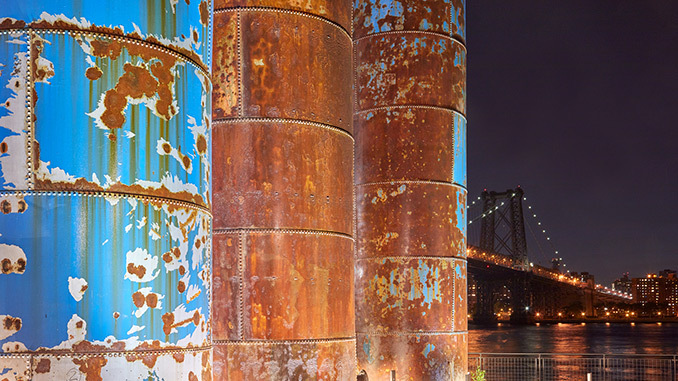 Reclaimed sugar refining and industrial artifacts and remnants are interspersed throughout the site, uncovering the story of the sugar trade in New York and the sugar refining process that occurred on the site for over a century. 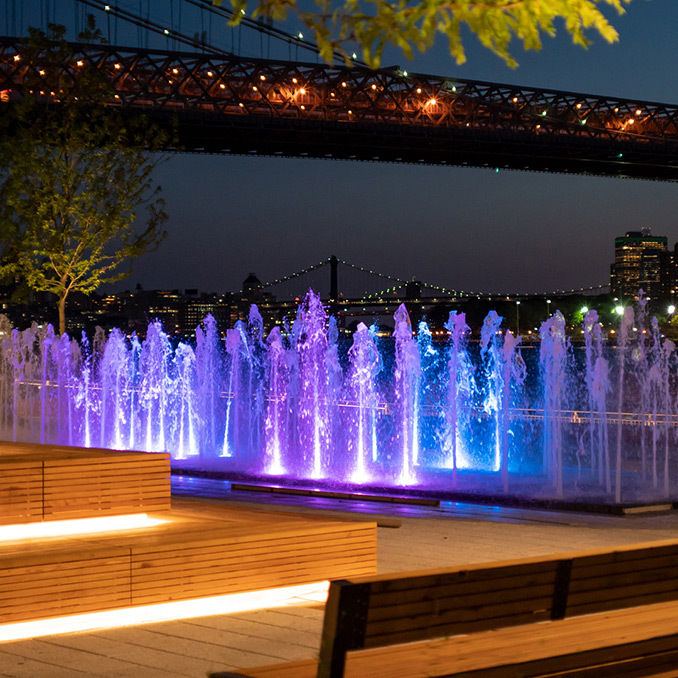 Two Trees’ total investment in the privately-funded public park is $50 million. 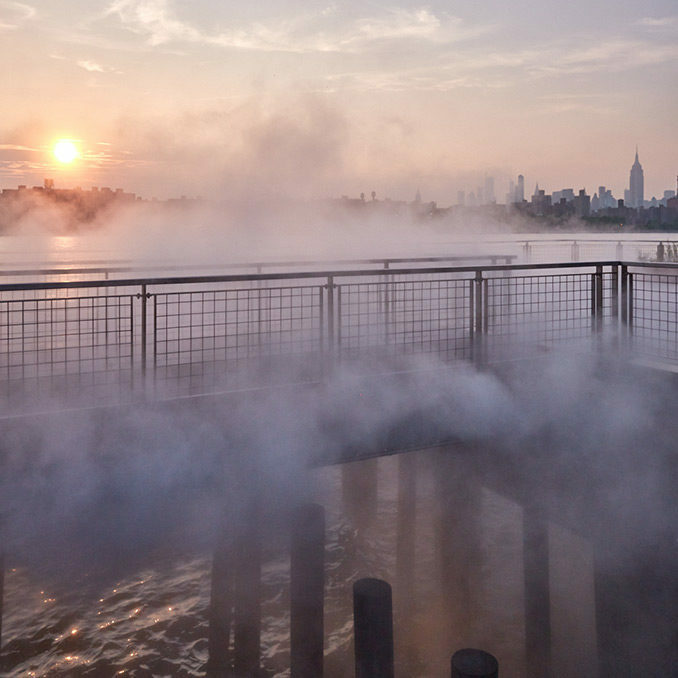 Domino Park will be open seven days a week from 6 a.m. to 1 a.m. The park is reachable from the East River Ferry, the L, J, and M trains, and local buses. 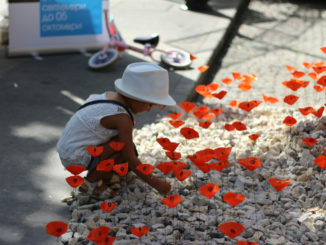 Park entrances are along Kent Avenue at South 5th Street, South 3rd Street and Grand Street. 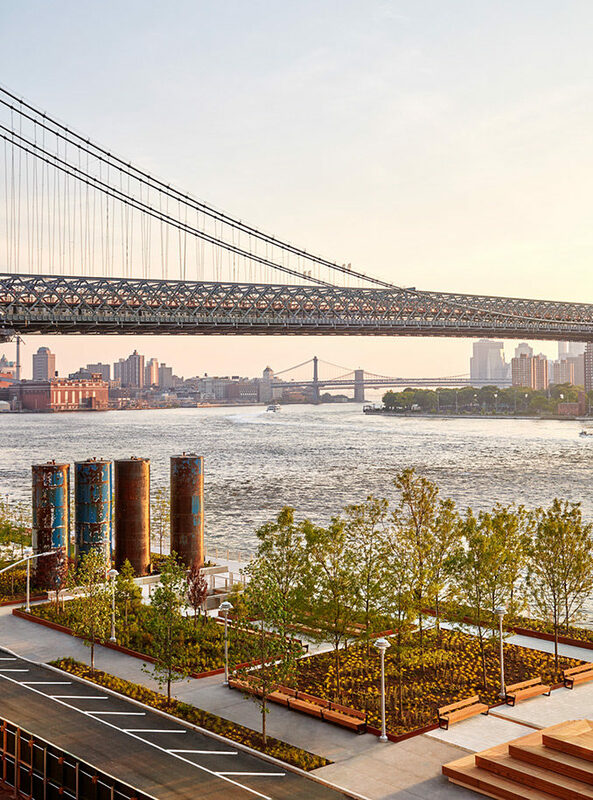 Mike Lampariello, the former Assistant Vice Principal of Operations at Brooklyn Bridge Park, will serve as Two Trees’ Director of Domino Park, overseeing a full-time horticulturist, a full-time public space manager and about 12 staff. 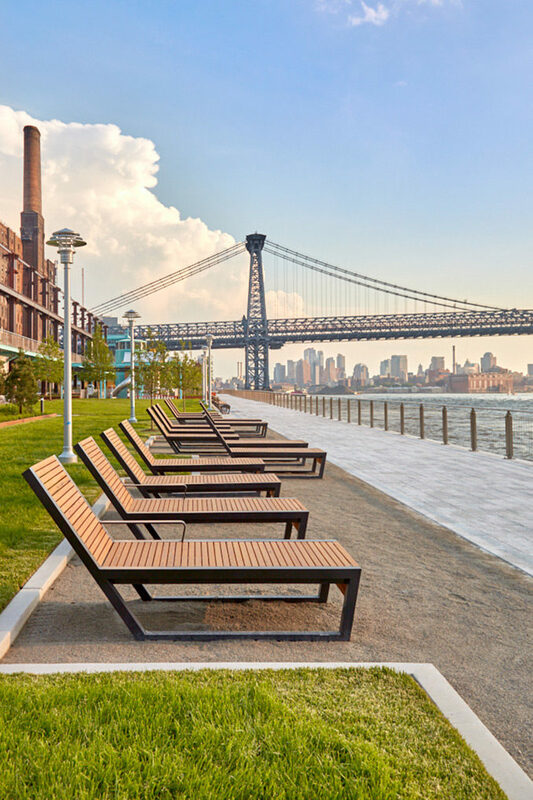 Domino Park is organized into three distinct programmatic areas, transitioning from more active uses near the Williamsburg Bridge at the southernmost end of the site to more passive uses at the northern end of the site. Extension of River Street. 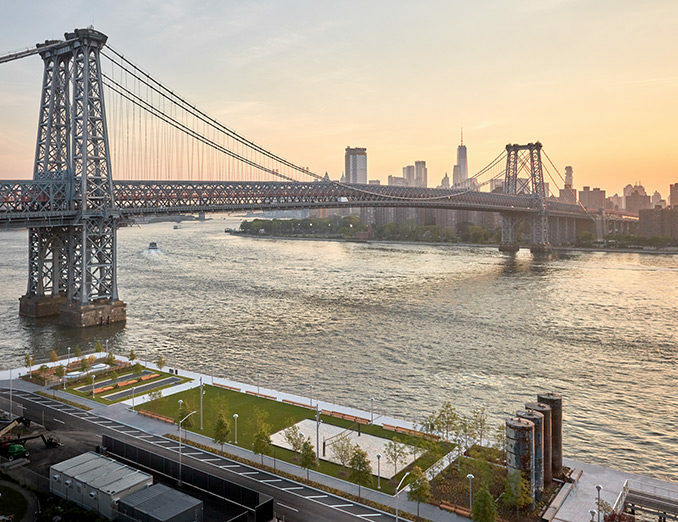 A key feature of SHoP Architects’ master plan for the Domino site is the extension of River Street, which now dead-ends at Grand Street. 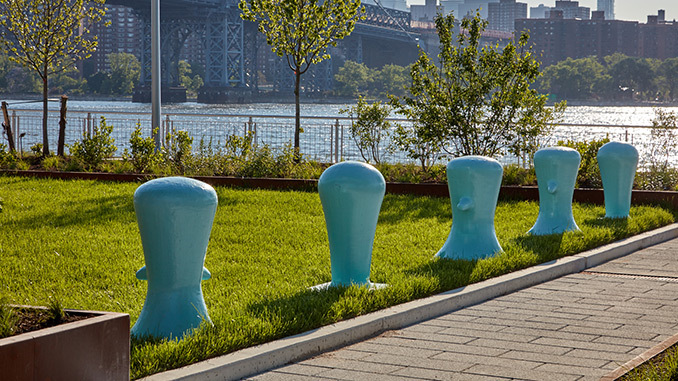 The connection of the Domino Site to the street grid is a purposeful urban gesture that draws people living in the community to the waterfront, so that the park becomes a part of daily life for tens of thousands of local residents who live in close proximity to the river but have historically been walled off from the riverfront and the expansive Manhattan views. 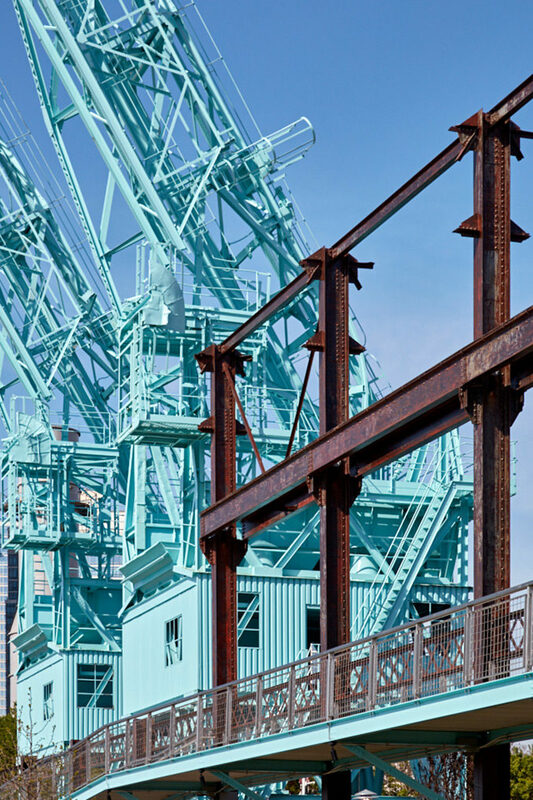 Drawing on the history of the 11-acre industrial site and the landmarked Refinery building, the five-block long Artifact Walk at the north end of the site integrates over 30 large-scale, handpicked pieces of salvaged factory machinery along the waterfront. 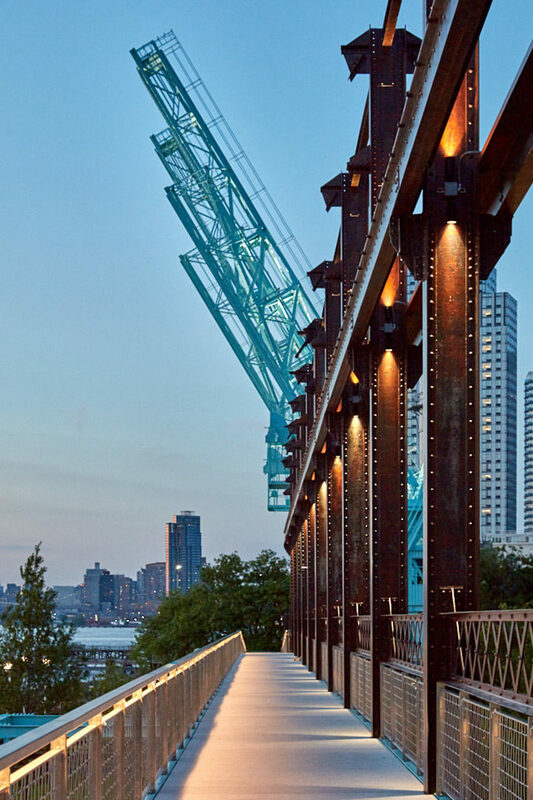 The Artifact Walk also includes 21 columns from the Raw Sugar Warehouse, which housed famed artist Kara Walker’s A Subtlety, and approximately 585 linear feet of crane tracks from the site that is incorporated into the design of the park. 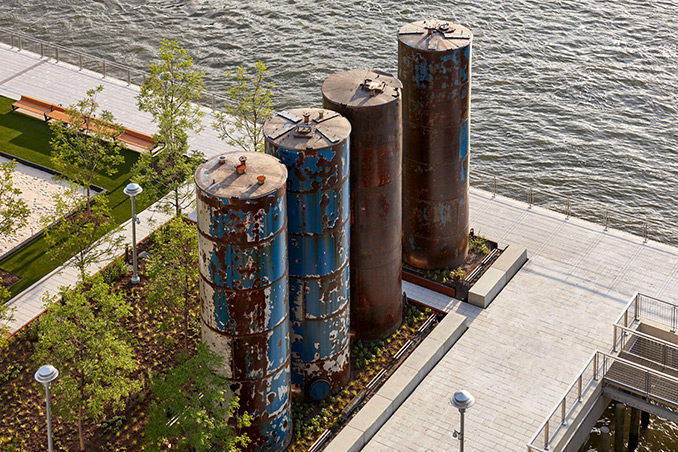 It also features four 36-foot tall cylindrical tanks that collected syrup during the refining process, mooring bollards, bucket elevators, and various dials and meters from the factory with original signage. 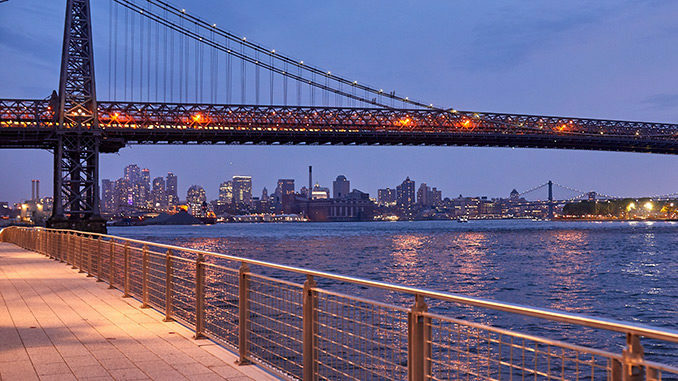 The 1,200-foot-long waterfront esplanade provides a continuous walk along the East River with panoramic views of the Manhattan skyline and Williamsburg Bridge. 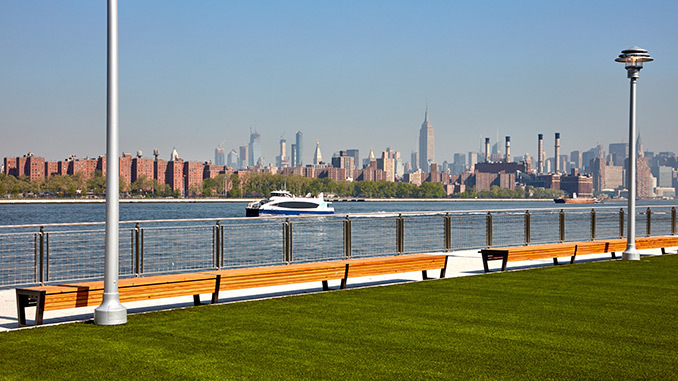 At the northern end of Domino Park, the passive recreation area from South 2nd Street to Grand Street includes a Japanese Pine garden at the entry, a 100-person picnic area, a food kiosk, a children’s playground inspired by the sugar refining process, a large sloping lawn and an urban beach with a flat shaded lawn area and chaise lounges. 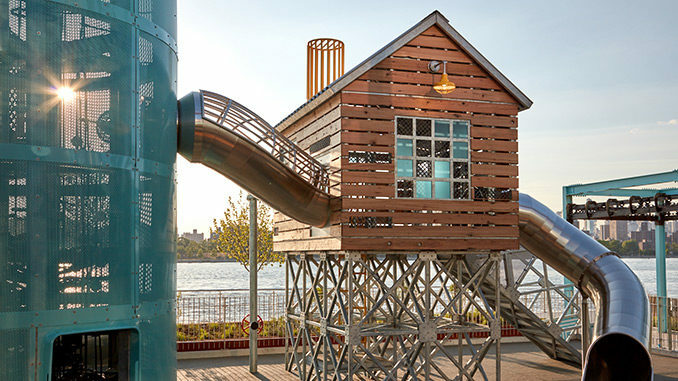 Designed by renowned artist Mark Reigelman, known for public art installations Smokers and The Meeting House, the playground pays homage to the Domino Sugar Factory and the history of the sugar industry with each portion taking children through a fun-filled representation of the sugar refining process. 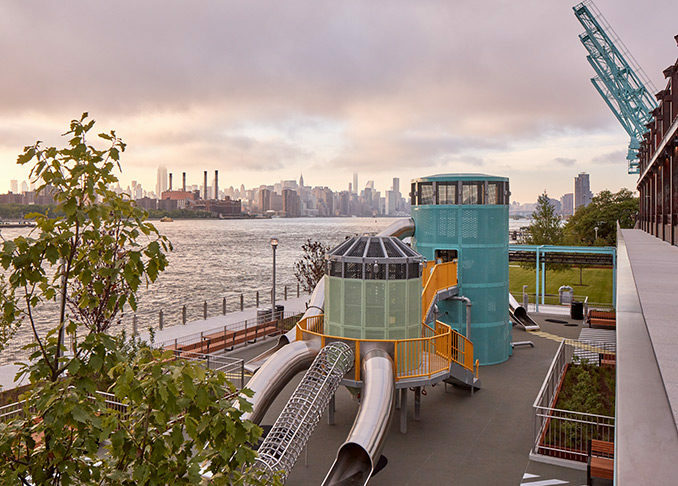 Through their playground journey, young-at-heart playground visitors can climb ramps, tunnel through tubes, brave conveyer belts and catapult out slides, all the while taking in the unrivaled views of the historic site, the Williamsburg Bridge and the Manhattan skyline. 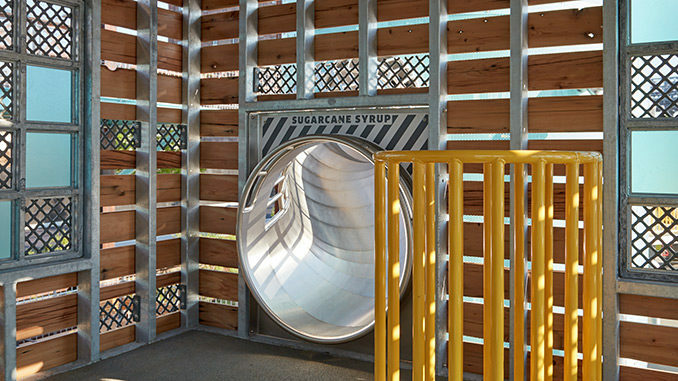 Embarking through three stages— Sugarcane Cabin, Sweetwater Silo and Sugar Cube Centrifuge—kids will be chopped and discarded from an industrial cabin, filtered into sweet water syrup, or emerge as perfectly refined raw sugar. Tying in the preserved industrial artifacts and elements from the park, Reigelman’s vibrant yellow, turquoise, green and brushed metal colors echo the original factory’s color palette. 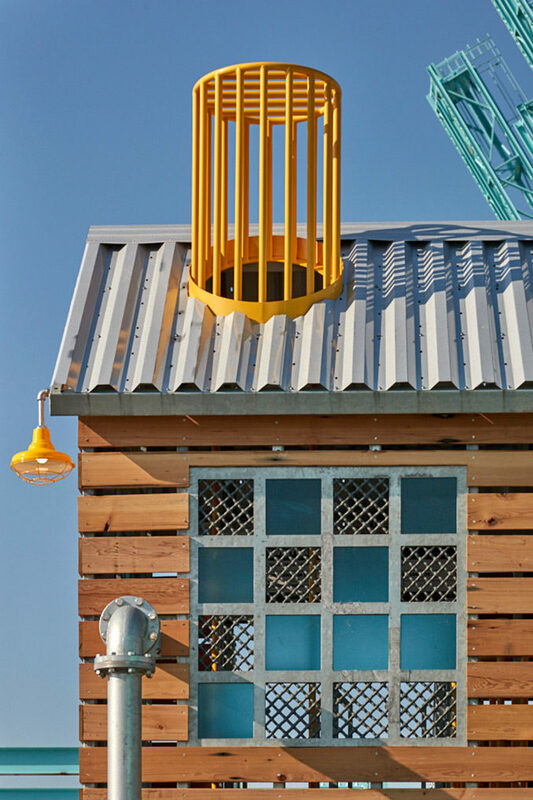 Reused wood from factory floors appear on the façade of the elevated cabin alongside brightly colored valve wheels cast from the original factory artifacts which are dispersed throughout the site. 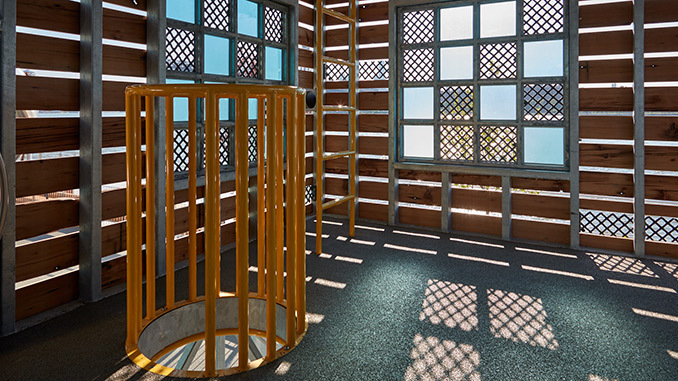 The three primary structures, an elevated cabin, towering silo and an industrial container along with stainless steel slides, climbers and catwalks are all reminiscent of the original factory’s complex architecture and infrastructure. 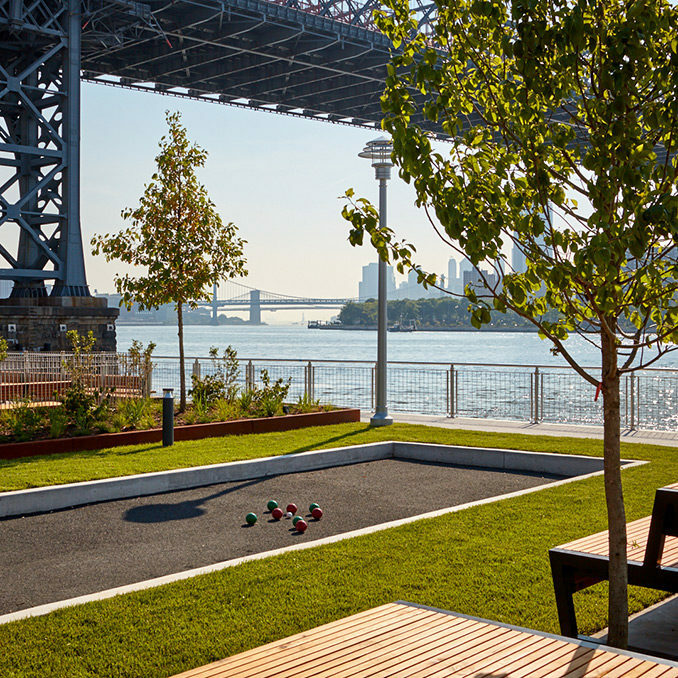 The active recreation area consists of interactive spaces for visitors including a 1,750-square foot linear dog run, two bocce ball courts, a 6,300-square-foot playing field for various sports, and a full-sized beach volleyball court. 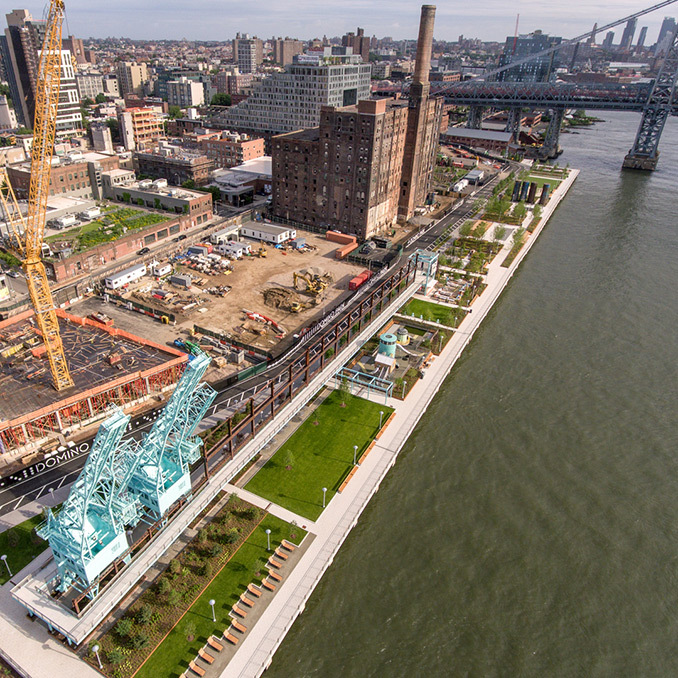 Fronting Kent Avenue, across from 325 Kent, Domino Square will be serving as another large-scale gathering place with programmable spaces and seasonal uses; it is projected to be completed in tandem with the Refinery building. 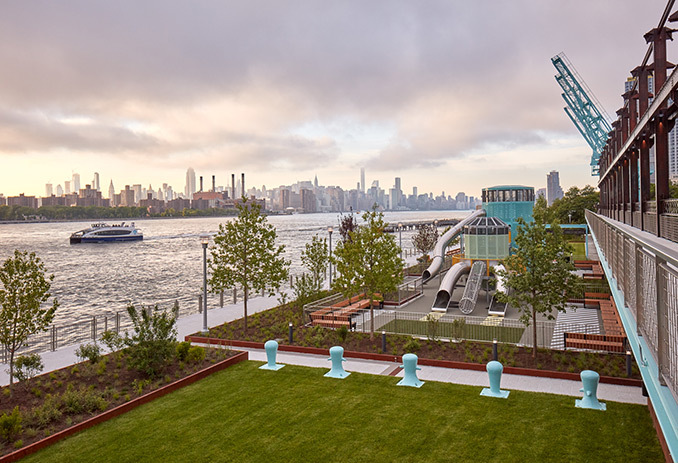 The park and open space incorporate a resilient design approach including raising the platform two to seven feet above the new FEMA flood elevations ensuring that the site will be protected from flooding. 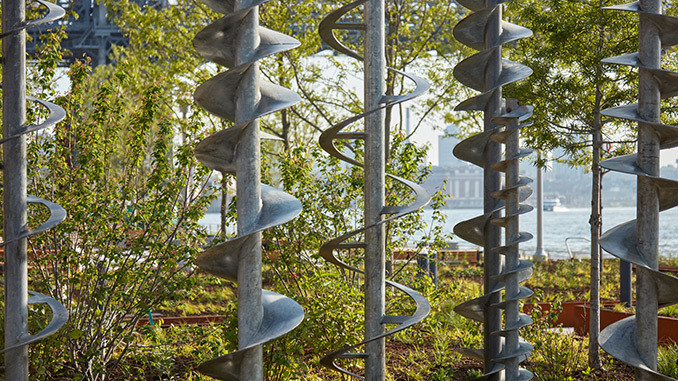 The park includes a sustainable plant palette contributing to coastal resilience including a mix of nearly 175 trees. Tacocina by Union Square Hospitality Group. 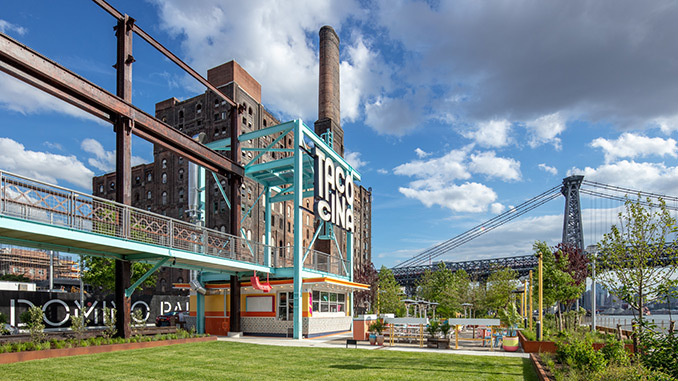 Danny Meyer’s Union Square Hospitality will open Tacocina, a standalone food and beverage destination offering a laid-back setting within Domino Park. 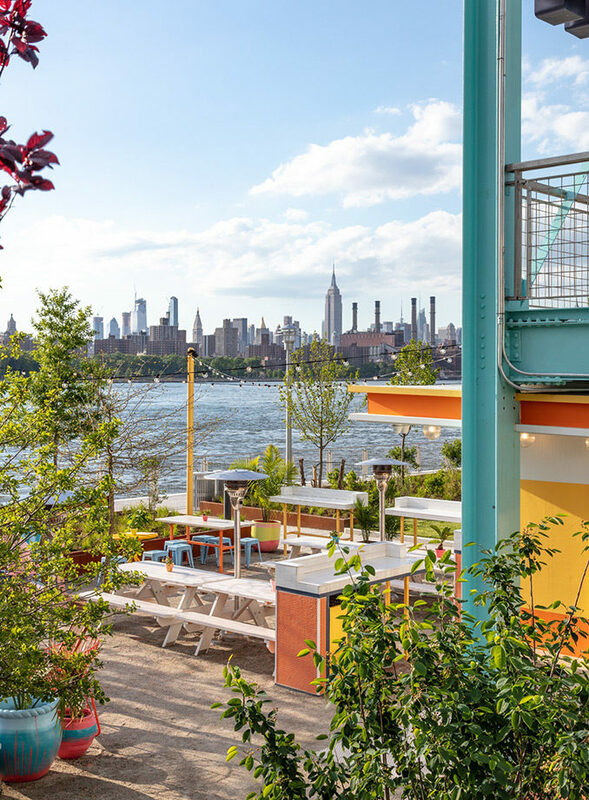 Serving up tacos, Mexican beer, and cocktails, the food kiosk marks Meyer’s first standalone venture in Brooklyn. 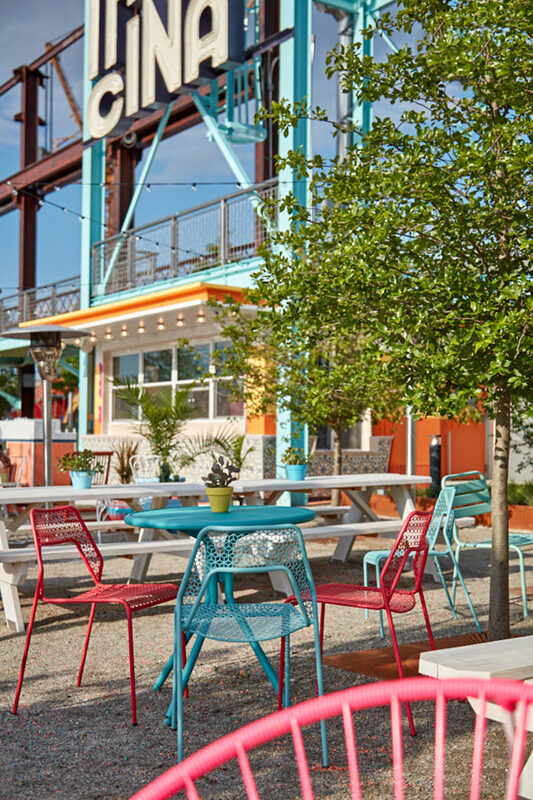 Tacocina will be open daily from 11 a.m. to 11 p.m. and have counter service and first-come, first-served outdoor seating space. 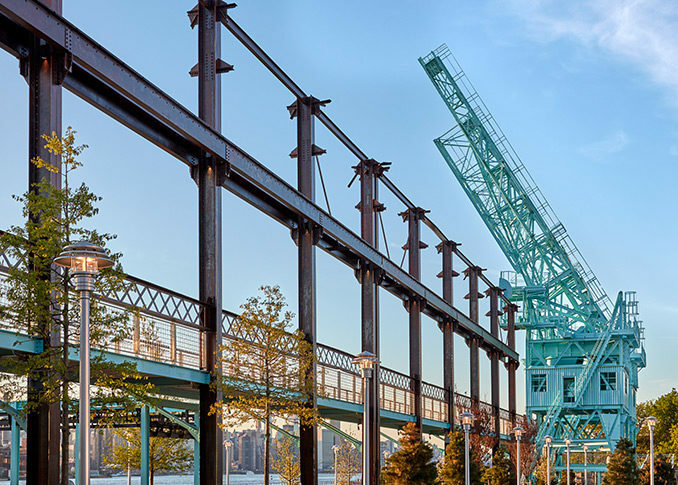 Built in 1856 on the Williamsburg waterfront, the Domino Sugar Factory, first owned by the American Sugar Refining Company, was one of the largest sugar manufacturing facilities in the world. 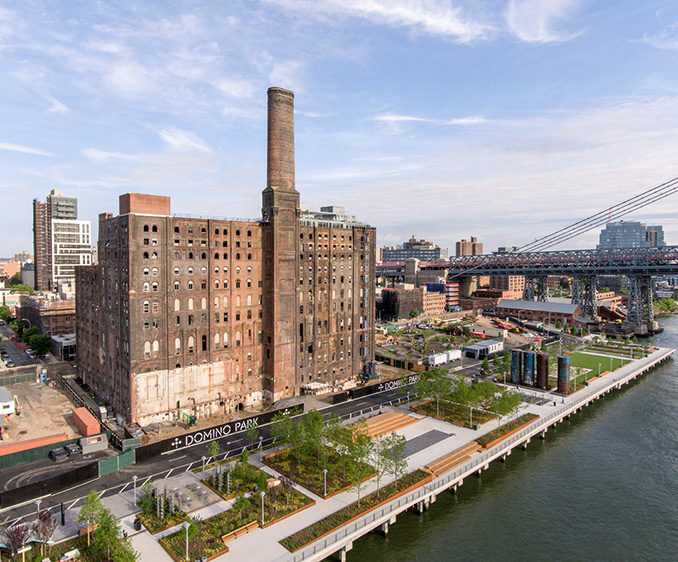 At its apex, the refinery produced four million pounds of sugar daily, and Domino Sugar supplied 98% of the sugar consumed in the United States. Raw sugarcane was sourced from all around the world as sugar went from a luxury good to a staple of American diets in the late 19th century. 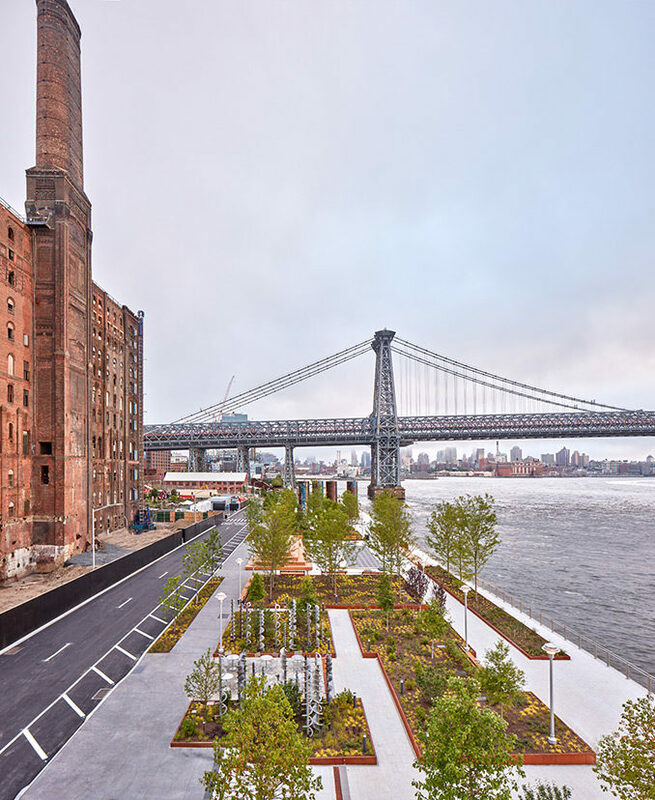 Following the closure of the Domino Sugar Factory in 2004, the 11-acre site sat dormant as plans for redevelopment were debated by the city, community stakeholders and the development team that purchased the site from Domino. 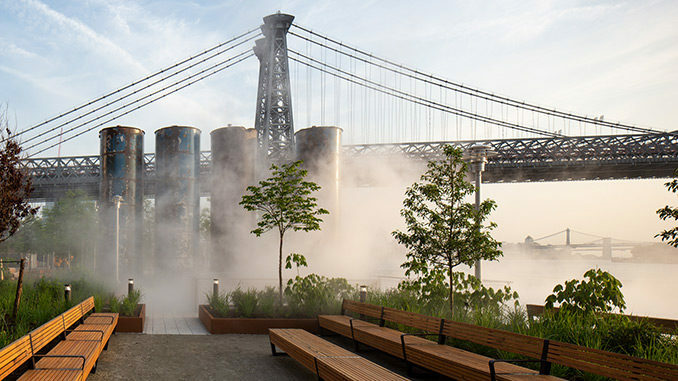 Eight years later, following a 2010 rezoning of the area, family-owned and Brooklyn-based Two Trees Management purchased the land in 2012 and presented new plans to redevelop the site, which included the adaptive reuse of the landmarked Domino Refinery, four new mixed-use residential buildings that will include 700 units of affordable housing, and a six-acre linear park situated at the forefront of the development called Domino Park.